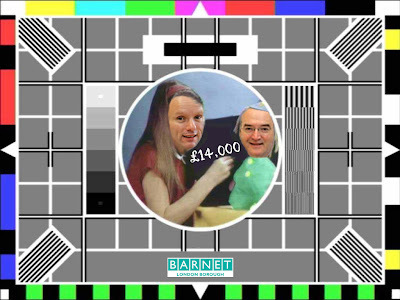 Regular readers will recall the furore last year when it was revealed that Barnet Council had spent £14,000 of taxpayers’ money purchasing five flat screen televisions for its Chief officers. You can see the invoices here. The ongoing Daily Telegraph investigation has shown that MPs also like to buy expensive televisions at our expense. Labour MP Sir Gerald Kaufman tried to claim a stonking £8,865 for his television whilst disgraced Justice Minister Shahid Malik tried to claim £2,100 for a Sony flat screen TV only to be told that the limit was £750. Some hard pressed taxpayers might feel that even £750 was rather generous for a telly! Be that as it may, Barnet Council allowed its officers to spend nearly four times the amount MPs are permitted to spend. At the time, Labour leader Alison Moore and LibDem leader Jack Cohen both condemned the expenditure. Only Conservative leader Mike Freer defended it. Perhaps Mr Freer would now care to take this opportunity to admit that he was wrong and, like the troughing MPs he hopes to join, apologise to taxpayers for this disgraceful abuse of public money. If the Barnet Greenspaces team is unambiguously charged with all Barnet allotments'management,why is rent collection delegated through self-collect or leased sites arrangements? Does it make sense to pay nearly GBP 3,000 to reward people who spend a total of 8 hours per year(YES GBP 3,000 FOR 8 HOURS 'WORK', 2 HOURS EACH SUNDAY IN APRIL- this amount is for one site only! )to collect rent on behalf of the Council? How much money in total is given to self-collect and leased sites? There are 11 self-collect sites receiving a 25% rent rebate and 18 leased sites receiving a 50% rent rebate. Why do people who already benefit from a leisure activity costing them less than GBP 56 per year for 10 poles of prime land should be rewarded for paying their rent? How much would it cost to hire an accountant or an administrative clerk based at the Town Hall to do the job part-time or on a fixed- term basis? If it is the responsability of the Greenspaces team to manage the allotments why can't they do it?